Can a Diet Brand Ever Have #ItAll? I love it when readers send me problematic ads from diet culture. It shows me that I’m engaging with savvy consumers who are really paying attention to the marketing they’re being shown. Today’s call out goes to Lean Cuisine and their #ItAll campaign. Honestly, I’m a little confused by the campaign. As others have pointed out, #ItAll is a little too reminiscent of #MeToo, and when the hashtag isn’t capitalized it could be read as “I, Tall” or “I.T. all.” But, morphological context aside, that’s far from the most confusing part. I think that what’s happening in this ad is that women were surveyed about their goals, and then are brought to this store where they are supposed to go shopping for the things they want in life. Then when they come up to the register, Dr. Emily Balcetis reveals that what they chose in the store was different than what they said they wanted on the survey. The conclusion she draws is that because of the supportive influence of another woman they respect, the vast majority of women made “more ambitious” choices than when they filled out the survey. Wow. That’s a lot to unpack. First, let’s talk about Dr. Balcetis, the expert collaborator on this ad. She’s a psychology professor at NYU and researches “motivational biases in visual and social perception and the consequential effects for behavior and navigation of the social world.” Basically, Dr. Balcetis’ work focuses on how what we see in our environment influences our choices. So, this ad makes sense for her work, especially given her 2014 TED Talk on exercise motivation in which she outlines the (troublesome) experiment she conducted about perceptions of walking distance. We have a social psychologist who studies how visual cognition influences choices leading the direction of an ad campaign that argues that people make different choices on a survey versus when they’re presented with those choices in a visually-oriented environment. Now, this is significant because the ad uses Dr. Balcetis’ credentials to reinforce the scientific legitimacy of a “social experiment” as a logical appeal. We’re supposed to be on board with this ad as proof that women feel more supported in the presence of other women. I could write a totally different article on the symbolism of the “women be shoppin’” tone of this ad and its metaphors of compulsory productivity under late capitalism, but that’s not why we’re here today. Instead, I want to talk about what happens when a diet brand pivots as a body positive brand. First, let’s talk about the history of Lean Cuisine. This brand was created in 1981 as a snappy, modern alternative to homestyle Stouffer’s frozen meals. 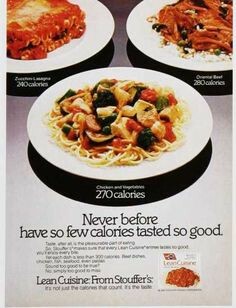 From the beginning, Lean Cuisine focused on its calorie count and its viability as a weight loss aid. If you read the brand timeline, you’ll see that Lean Cuisine taglines and other marketing followed the popular diet trends of the day — from touting its 98% fat-free products in the early 1990s to faux-gourmet in the late 1990s to the low-carb craze of the early 2000s. 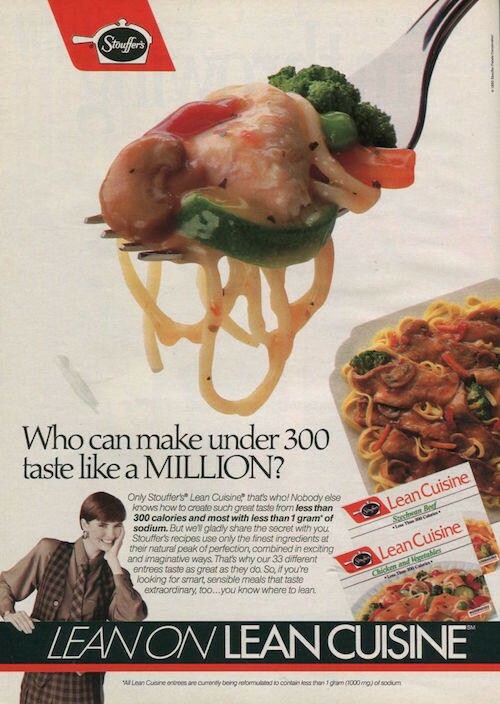 Lean Cuisine honed in on the professional working woman who is too overworked to prepare a home-cooked meal hustling to have it all on 1200 calories or less. This isn’t Lean Cuisine’s first attempt at a campaign to help us forget the brand’s role in perpetuating diet culture for over 35 years. So, we’re now supposed to believe that Lean Cuisine is on our side and values women for their accomplisments? We’re supposed to believe that the brand is here to support our ambitions with a “Feed Your Phenomenal” tagline? Lean Cuisine, hat-tipped to the obvious branding of “lean” in the name, is a weight loss product. Even though they’ve continued to swing and miss at a proto-feminist, body positive campaign series for a few years, their core product promotes weight loss as a feminine imperative. And that’s why this #ItAll ad is so troubling to me — diet culture pits women against each other, constantly comparing who is winning and who is losing the battle of the bulge. I host a body positive lunch club called Relish, and its whole point is to help people practice eating in public again. We have been conditioned so thoroughly that there’s a right way to eat lunch and a wrong way to eat lunch because of brands like Lean Cuisine that define what a sensible meal looks like — under 300 calories! — AND for how we should prioritize calorie count when we talk about what we eat. For Lean Cuisine’s primary audience of women, communal body shaming and diet talk is a foundational bonding activity, so to successfully distance the brand from that legacy means dismantling the monster it helped create. Lean Cuisine, you cannot use a positive message of support to sell a product that presumes — based on its very existence — that women are not good enough as they are. You cannot promote limitless and wholehearted ambition in work, love, family, and community with one eye on the scale. The revolution will not be microwaved. Dr. Kate Browne helps people learn how to take up space in business and life as an autobiographical writing expert and brand storyteller. She has over ten years of experience teaching persuasive writing, and uses her PhD in rhetoric for good to help health & wellness businesses grow their marketing reach. Kate is also the founder of Taking Up Space, a self-care advocacy project that educates consumers about positive marketing in the health, wellness, and fitness industries.